Garbi Armii - Vocalist, multi-instrumentalist, composer and producer, Garbi is former lead singer and virtuoso Didjeridu player with the legendary dub band Suns of Arqa and appears on the album Shabada. He was also frontman for the traditional/techno band Celtarabia and was responsible for introducing the dance, dub and ethnic elements to their sound (re: album Lost Music of Celtarabia). Garbi's passion for instruments and music of other cultures has served as a prime mover for his work including the development of his amazing freestyle singing which fuses Indo/Arabic phoenetics with more conventional 'Western' vocal and rap techniques. He completed his compositions and arrangements for millenium timebomb, which he also co-produced, and his concepts for its music and artwork won him the 1997 Arts Council 'Breakthrough Award' for 'outstanding achievement in contemporary and non-western music'. More recently Garbi was co-producer/arranger for part of the Excalibur album (Warner Bros) which reached Number 1 in the French charts. His voice, string arrangements and lyre playing appear on Finbar Furey's latest album. He is currently working on material for a new album, composing for several projects and has just been awarded a New Composers bursary to work with musicians from the Himalayan region of West Bengal. Garry Low - Percussionist, drummer, sound engineer and producer, in recent years Garry has concentrated on the development of his phenomenal percussion skills. He now plays a unique blend of drum kit and African percussion which has provided much of the driving force behind Celtarabia and the album millenium timebomb which he co-produced with Garbi and on which he composed two tracks. His playing also features on Sessions debut album by Bohinta, their latest album currently being recorded at RealWorld Studios and the brand new album by 'Prince of Pipers' - Finbar Furey. Garry recently co-produced/arranged part of the Excalibur album and has also completed drum kit/percussion, engineering and production on Aine Furey's debut solo album. Garry is currently working with the Royal Shakespeare Company as resident percussionist for a trilogy of Irish plays. Eddie Armitage (right) - An amazing violinist who produces an entirely sensuous Indo-European sound that is very much his own. Eddie has played with numerous bands and theatre projects providing soundscapes for Dream Tent, Jabadao and Ship of Fools as well as weaving his magic between the dance and traditional elements of the band Celtarabia. He is also highly skilled on Rebec (Medieval Violin), Classical Guitar, and Saz (a Turkish Bazouki). Paul Holland - The incredible bass guitarist formerly of Definition of Sound returns to the live circuit as Headhunters' latest member. His natural dub 'feel' playing is a great asset to the new line-up. Pauls pedigree is unbelievable having played as a session artist with several top bands. He was co-founder of eighties band Buzz the Joint who appeared on the Chartshow and also worked with X-Ray Specs and Crispin Mills of Kula Shaker before achieving major chart success with the album Love and Life: Journey With the Chameleons. A string of hits followed to include Moira Janes Caf� and Now is Tomorrow. David Hughes - Former Jazz Musician of the Year David plays cello with Headhunters, fusing classical, Indian Ragaas, Jazz and contemporary dance sounds. His first instrument is guitar and was a cult figure on the New York jazz scene. He was spotted by producer John Leckie and subsequently returned to the UK to record an album for EMI featuring singer Eddie Reader. David has since been involved in several recording projects and has won many awards for film and TV composition. As well as playing with Headhunters, David has his own quintet Cellorythmics featuring the BBC classical musician of the year Alfia NapikBekova. Under the pseudonym James Hesford, David has recently recorded a CD of his own compositions with Gabriel Gorsky. DJ Usama - From the Sudanese Dafaalla tribe, this highly creative DJ is rapidly carving a name for himself in the British Hip Hop scene. Mixing Old School scratching techniques with new formats within the genre, Usama is a highly versatile performer. He is already well established on the Midlands Hip Hop scene having organised events celebrating Hip Hop culture for several years. Usama has joined Headhunters for their 1999/2000 line-up. Kadir Durvesh - Quite simply one of the greatest exponents of the double receded Shenai (Indian Oboe) in the world. Hailing from a long line of classical Indian players, Kadir has worked alongside Ravi Shankar, George Harrison, Nusrat Fateh Ali Khan and Barbara Streisand to name but a few. He is no stranger to crossover projects having performed with Suns of Arqa, Joi Bangra and Nitin Sawhney. 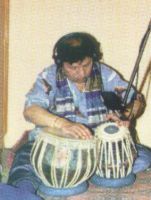 He is also skilled on Tabla, Dholak, Harmonium and Indian Flutes and has appeared on no less than eighty five albums! �ine Furey (right) - Described as having the 'Voice of Angels', �ine is currently residing in the 'top ten' in New Zealand, Australian and Italian charts with the album Celtic Woman. It has just been released in the UK to rave reviews. �ine sings with the band Bohinta but has also recently secured a record deal for a solo album to be released shortly. Martin Furey (left) - Founder member of the band Bohinta, Martin is an excellent singer, composer and multi-instrumentalist. He displays incredible skill on guitar, whistles and, following the tradition of his father Finbar Furey, the Uilleann Pipes. Bohinta have received international acclaim for their debut album Sessions and for their live performances. Martin's work has also appeared on several film and TV soundtracks including work with David Low of Touch & Go. He has recently appeared on VH1 and been recently signed to Warner Bros.
Nigel Kennedy - Nothing more can be said about this man's virtuosity. His astounding acoustic and electric violin playing appear throughout the album 'Millenium Timebomb'. Kennedy may on occasion appear live with Headhunters subject to his own agenda. Ian 'Eezer' Jenkins - One of the most outstanding bass players that this country (England) has to offer. He has developed his abilities over the last eighteen years to become a complete master of his instrument. Playing a five string 'Musicman' bass guitar, his highly distinctive Dub/Funk style appears on several tracks on millenium timebomb. 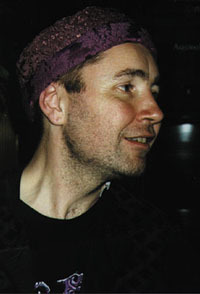 Ian has also been a session player on several projects including Nigel Kennedy's. Matthew Devenish - Sound engineer and drummer, Matthew has built up a sizeable reputation for his live dub mixing and studio skills. He has worked at the famous Abbey Road Studios as well as Metropolis, Parisfal, Swanyard and RealWorld. 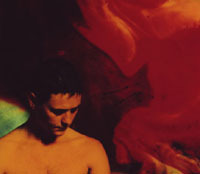 Artists he has worked with include Nigel Kennedy and William Orbit. Paul Hawes - Paul, 42, was originally trained in classical guitar. 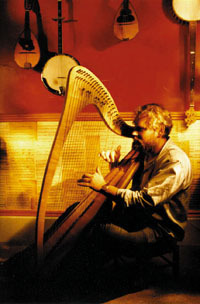 He switched to folk violin because of his love of the music and proceeded to also design and make his own Celtic Harps. His playing features on Crossroad Connection and he will be touring with the Vikki Clayton band at folk festivals throughout next summer.